This is the first time I've heard about this. 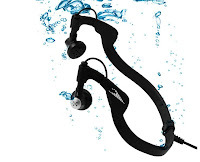 I didn't know there were underwater headsets out in the market, and this is actually their third generation of waterproof/underwater headsets. H2O Audio has release the H3 waterproof headphones which they claim have better sound quality than their previous headphones. Maybe I'll review one of these one of these days.